I was never really a fan of toms. It seemed that everyone I knew was wearing the canvas shoes (and t-shirts and leggings; so not my thing). But I was in line at the Loft the other day, and the lady in front of me had the cutest wedges on, with the Toms logo on the back. So naturally, I had to investigate this further by online shopping (like I need an excuse to online shop, but go with my story anyway). For every purchase of a pair of shoes, Toms donates a pair to a child in need. By doing this, it allows children to go to school (since many schools require proper footwear, much like our "no shirt, no shoes, no service" restrictions). By wearing shoes, it also prevents cuts and diseases from occurring from walking barefoot. You can read more about how the shoes are made and distributed here. And for every pair of eye glasses purchased, Toms contributes to improving the sight of those in need. They help provide life-altering surgeries (like removing cataracts, the primary cause of blindness around the world), and provide prescription glasses. You can read more about the initiative here. 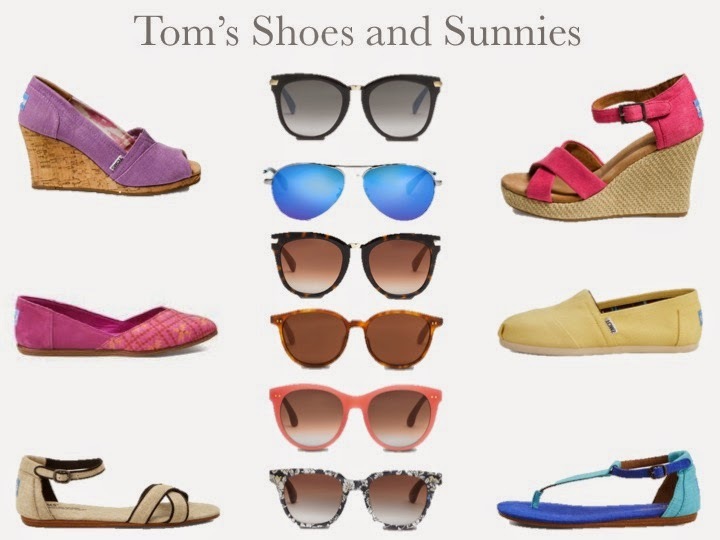 Have you ever tried a pair of Toms? Are you a fan of their shoes and causes?